Is it Possible to Stop the Clock? This is an exciting time to be an aging adult. There is so much research on ways we can control how we age and whether or not we are faced with diseases. It is, in part, in our hands. I am excited to join a group of experts on a free webinar on aging more vibrantly. This seven-day Free on-line retreat starts in two days April 21st through April 27th. There will be different speakers every day giving you the best tips to feel your best after 40. And there is more than $1500 worth of free gifts offered by attending this retreat. Find out more here . ** Work Less & Live More ** Find Your MoJo ** …And MUCH MORE! Click here for more information about the speakers. During this Ageless Beauty episode, I will share my personal health journey that began over 30 years ago. I will address toxins, where and how we come in contact with them, common symptoms when we have been exposed and my top tips and techniques for eliminating them. I will also be guiding and teaching you yoga poses you can do to detox your body from the inside out. Don’t forget to register by signing up here. The link is at the top of the page. 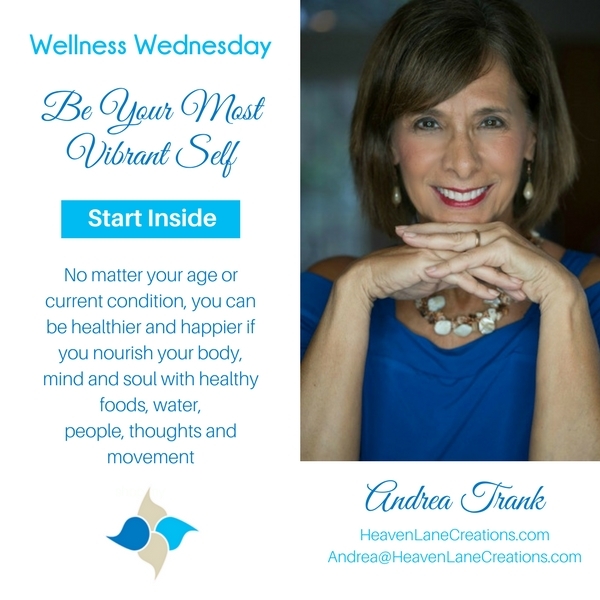 Please feel free to contact me at 239-634-0739 or andrea@heavenlanecreations.com for a FREE 30-minute consultation, and discover how Heaven Lane can work with you on the path to health and happiness. If you are interested in jewelry, you can use the contact form or order through my ETSY store.